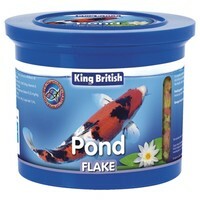 King British Pond Flake Food is made using only the finest ingredients. Specially formulated to meet the nutritional requirements of pond fish, King British Pond Flake Food offers your fish a nutritional, well-balanced diet. This food is high in protein for healthy, energetic fish and has a low waste formula for minimum fish waste.